Play "grocery store," asking the child to shop for specific items. You might give him/her a shopping list with pictures on it or simple words. Ask the child to put one type of play food into the shopping cart. 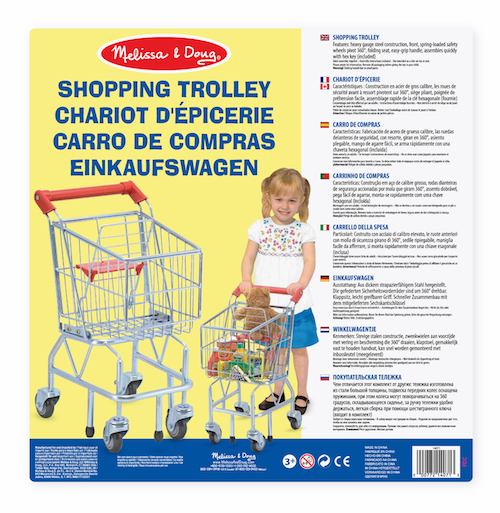 Then ask the child to follow your directions to load, roll and unload the cart. For example, have him/her put all frozen or cold foods in the cart, then roll it to the end of the room, unload it and return for all the fruits and vegetables. Set up a mega-supermarket! 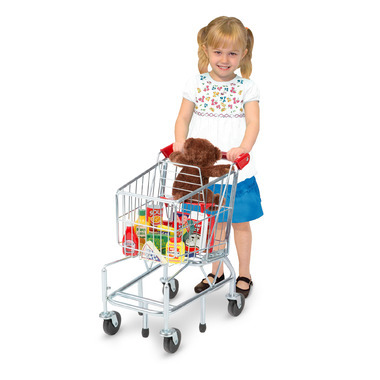 Ask the child to carefully wheel the shopping cart from room to room, collecting a different type of food in each one. (Room 1 might be fruits and vegetables, and room 2 might be dairy products.) Have some fun . . . make the hallway "Aisle 1" and the kitchen a checkout area where Mom or Dad plays cashier. Then switch roles! Look like a true one. Solid and good looking. I recommanded this purchase! My 2 and half daughter LOVE it! This is absolutely the most adorable and realistic shopping cart I have ever seen. My granddaughters love playing with it. It was easy to put together and the wheels move very smoothly. It was the biggest hit at a birthday party with all my grandchildren. Sturdy and well built. Now I have to buy more!! Very sturdy. Rolls very smoothly. Great quality. 2 year old and 3 year old are absolutely loving it and use it constantly. 5 year old finds creative uses. My boys loooove this cart. I bought it for a 5yr old's birthday and her mom tells me she looooooves it too. Very high quality and realistic! My 2 year old daughter absolutely LOVES this cart; it's very sturdy and rolls/turns very well. It's perfect for her height. Just watch out the cart is quite heavy, she has fallen with it once or twice and it hurts!